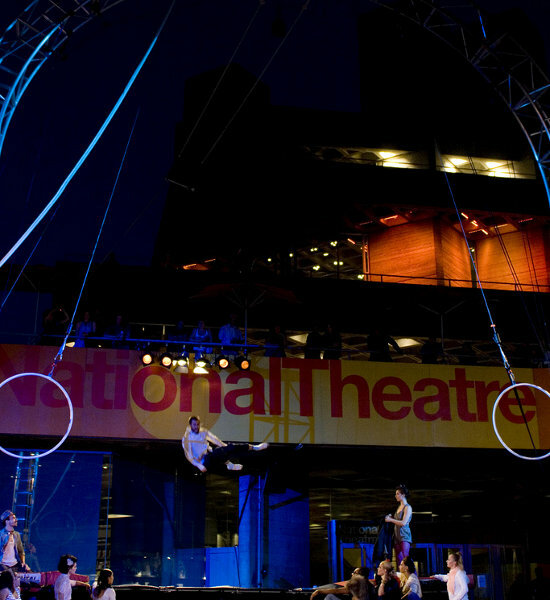 Now in his sixth year programming the National Theatre's three-month, outdoor mega-festival Watch This Space, Angus MacKechnie talks to Sideshow about the WTS residencies, stretching the budget, and pulling in the Alan Bennett audience. So for the last couple of years at least WTS has kicked off with a series of week-long residencies. How do those work? What's offered? It's varied actually – everyone is different. One of the key things behind the residencies is my very, very small budget, because by offering a company a week's worth of work I can get value in terms of what I'm able to put out there. And the Gandinis are a prime example of that – they're working in a much bigger group than if I booked them bit by bit by bit; they're up to a group of nine for Smashed! which is great. And then what we're able to do is include within that a commission – which this year Mimbre and the Gandinis are doing. In a different way it almost feels that Circus Space are doing it too – in that it's a brand new show that comes here. Now, it's a show they would do anyway, so it's a slight cheat, but it means we get new work and a density of performers I couldn't afford – over 15 – ever. So there's a real pragmatic side to the residencies – and then the other side is that I really want people to engage with these companies as individuals and as artists, and I think that by having them here for longer than one show we really enable that. Hence we try always to put something participatory in – so we're not just ticking off the workshop box, but you can see those people do their work and then work with them. So that's very different again to running a circus workshop programme. Also, to actually get to work with Sean and Kati from the Gandinis is pretty good – a free workshop with them. Particularly for Sean and Kati, who are at the top of their game, we did a professional workshop with them, which was again free and part of the programme, but you needed a level of skill... I really wanted to make sure we could get something out of it – for them and for the people taking part. They all work differently. Mimbre have been down at the National Theatre Studio for a week this year, which is completely financed by the Studio separately. Again, if I didn't have them for a week I don't think my colleagues at the Studio would invest in the same way. And they've created a very, very different piece of work to their usual stuff – again that's the freedom of a week where they can work in their case with a group of ten. So they're stretching themselves and now we've got a Mimbre piece with ten people in it. It's not finished yet; it'll be a bit rough and ready I hope, because the residency week allows that. Another thing is it's so much nicer for us working on it – to be able to work with a company for a longer period, even a week. It's very different from just doing the show get-in, lighting it and then immediately doing the get-out, when you don't end up having any relationship with the artists and the work doesn't develop in the space. Do you have any way of knowing what sort of proportion of the audience end up coming back and seeing the work again? I can't pretend we have really good data on it because we don't. And I'm loath to talk it up too much actually, because I think a lot of outdoor work comes up with crazy figures of thousands come and engage and I know the space and they can't fit that many people in there. Anecdotally, I know I see the same people out there a lot. I can recognise patterns of when people arrive with their programme in a very specific place at a very specific time – you do start reading that. And there are a lot of regulars – people who know who we are – and also you get a pattern of obviously during the day it's much younger and that's where we put all the young people's stuff. I see parents carefully scouring the programme and working out what to do... but it can only be anecdotal. It seems like there's a big coincidental audience – people passing by on the South Bank, and then disgorged audiences coming out of the NT main theatre. The night-time shows of [Circus Space's Step It Out] crossed with two shows coming out of the main theatre actually – which doesn't always happen, but that one did so suddenly we added on to the audience. Sometimes it can be a bit annoying, but in that case the show was big enough to take it. It felt right. It's a massive festival? Why is it so long? It's funny factors. It went into September tentatively two years ago, when the main houses started opening on a Sunday. And actually I'd always found it a bit frustrating that we weren't open on a Sunday. So I did find that frustrating, but it's very expensive to open the building just for toilet and café use – so as soon as that happened, the first year of the Sunday openings, we wanted to use them for Watch This Space – and they happened to start in September, so we extended that way and found also it was the best time for weather. And this year we extended back the other way because of LIFT. The dates of LIFT and the show we really wanted to put in, Life Streaming, took it back into June. So we did a sort of soft start a week early and then the first week we did Circus Space. Add the four weeks on the end and you've got fourteen weeks. My first year of doing it was seven or eight so it's getting close to have doubled. Are you going to see their piece this year? It's like a piece of Pina Bausch; it's bizarre and brilliant. It's almost not quite right for Square 1 because it's quite subtle, but they're broad enough performers that it doesn't matter. So I do hope there's always the crossover, but we have Teatr Biuro Podróży this week – I wouldn't put that in the main space, it wouldn't get the concentration. Life Streaming was about the tsunami and again that was about a confined space – totally inappropriate in the main square. So Square2 does allow me to go into a different area, and we're selling tickets for it as the National Theatre and that's making a very, very different statement than 'come along and join the free fun'. I'm heartened to see, because I can trace who buys tickets when, that a lot of our regular National Theatre list are out there. I was watching as each priority booking group opened up and I thought we wouldn't sell anything until it went public, but I watched it and saw they were coming – not in the same huge numbers as they come to Alan Bennett, but they are coming to see us out there. So that's a good thing; I think were educating the audience a bit there – saying it's not just the main theatre shows that we do. And of course then we get a huge walk-up of people who've perhaps not bought a theatre ticket in their life. But I think there's stuff out there that's challenging. In my first year I remember a few programming errors where I thought, What have I done to these artists by putting them on at 6 on a Friday – it's not appropriate. I've learned more now about how far you can really push it and what you can put out there. And do you have any idea what you're going to put out there next year? There's a funny thing going on out there at the moment which is about money – on the one hand the free work becomes more and more valuable to people for totally obvious reasons, and I think it's brilliant when I see parents working out how to keep their kids entertained over the summer and they're sitting here studying the brochure working out which festival to go to next. Greenwich and Docklands this day, National the next – brilliant. And it takes on a huge value – and I know that because if something goes on late or if there's a change in the programme I get the complaints of people saying But I paid my bus fare to come to you today. On the other side of that I am, like the whole of this organisation, bracing for cuts and for how we deal with those maintaining as best we can everything that we do. So my hunch would be it won't be fourteen weeks next year, but the obvious thing would be to just keep the quality and make it shorter. Angus MacKechnie is Producer for the National Theatre's Watch This Space Festival, which in 2010 ran 23 July to 26 September. He was interviewed 16 July 2010 in one of the alcoves of the NT's billowing ground floor lobby.